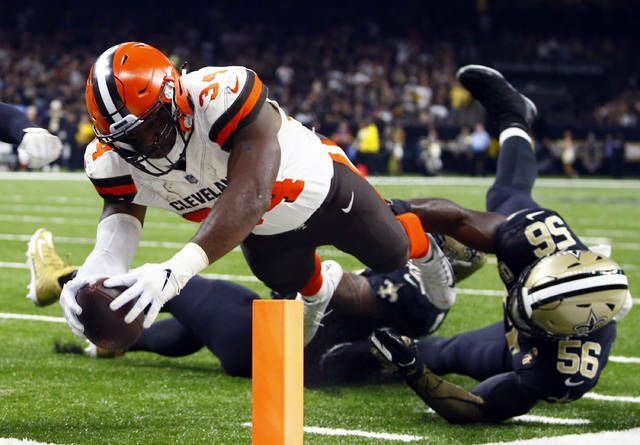 JACKSONVILLE, Fla. (AP) — The Jacksonville Jaguars traded for Cleveland running back Carlos Hyde on Friday, adding a proven starter while Leonard Fournette progresses slowly from a strained right hamstring. The Browns (2-3-1) will get a 2019 fifth-round draft pick from the Jaguars in exchange for Hyde, who has 382 yards rushing and five touchdowns in his first season in Cleveland. Hyde signed a three-year, $15.25 million contract in March. The Jaguars (3-3) were willing to take on the financial commitment because leading rusher T.J. Yeldon will become a free agent at the end of this season. So will third-stringer Corey Grant, who was placed on injured reserve last week because of a foot injury. The Jaguars signed veteran Jamaal Charles to a one-year contract to replace Grant. Fournette was ruled out for Sunday’s game against Houston. It will be the fifth game he’s missed this season because of the nagging injury. Cleveland had seemed pleased with Hyde, but his departure clears the way for rookie Nick Chubb to be the team’s primary back. He’s averaging nearly 10 yards per carry. Browns general manager John Dorsey continues to revamp the team’s roster and add picks. In addition to their own picks in the first six rounds, the Browns acquired a third-rounder from New England, Jacksonville’s fifth-rounder, another fifth-rounder from New England and a seventh-rounder from Jacksonville. The NFL trading deadline is Oct. 30. The Jaguars built their offense around Fournette, a bruising runner and the fourth overall pick in the 2017 draft. He tried to return after missing two games earlier this season but re-injured his hamstring and has been sidelined since. Yeldon, meanwhile, is dealing with foot and ankle injuries. Making Jacksonville’s offense even more stagnant, the team is without its top two left tackles, its top two tight ends and its leading receiver from 2017. The 28-year-old Hyde was off to an impressive start in Cleveland. But he was taking playing time away from Chubb, who scored on two long touchdown runs at Oakland on Sept. 30 and enters Sunday’s game averaging 10.8 yards on 16 carries. Also, running back Duke Johnson had gone from being a dual threat to mainly a receiver. He’s had just 19 carries this season. Earlier this week, Browns coach Hue Jackson said it was vital to get Chubb more touches. Chubb had only three carries for 25 yards last week in a loss to the Los Angeles Chargers.